Help related to uploading and publishing simulations and 3D models on FetchCFD. File formats, categorization and more. The FetchCFD Community is all about collaboration, we strongly encourage you to upload simulation projects you've created. Sharing your work in the Community is a great way to get feedback on your work, but it is also a great way to build an online portfolio of your skills. Uploading your simulations can help other members save time and can help showcase your talents to your peers. It doesn't matter which software you used to create your simulations and designs FetchCFD can host and manage all types of files (CFD, FEA, simulation files, CAD, 3D models, codes, ZIP files, etc.) and images (JPG, PNG, TIFF, GIF, etc.). There are plenty of ways to get your projects published on FetchCFD in 3D. You can click Upload in the top-right corner of any FetchCFD page to upload any of our supported file formats for 3D publishing, or you could go to your profile page and upload 3D files through Upload Content button.  If 3D format you need isn’t listed here, contact us at contact@fetchcfd.com and we will try to add it. 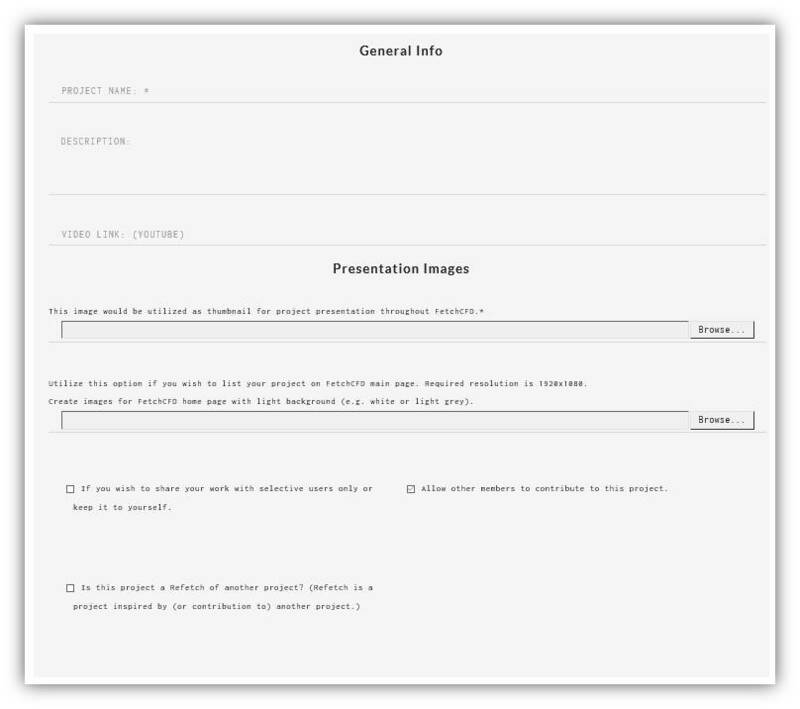 You should choose the most accurate and specific categories and tags for you project. Tags, and categories make sure your simulations and models show up in search. Click on the Upload button that’s available on the top-right corner of any FetchCFD page. You’ll then be prompted to choose the file(s) you’d like to upload - Drag and drop your files (simulation files, CAD, 3D models, codes, ZIP files, etc.) and images (JPG, PNG, TIFF, GIF, etc.) into the outlined box or click on this box to upload files. Depending on the size of your files, it may take some time to finish uploading. - Project Name: Make it short and descriptive, double check spelling and grammar. - Description: You should explain the project details and why you created this project and how others can use it. The more details, the better. - Presentation Image: This will be the image that best represents your project in the library. Add high quality image that best represents your project. Plus, you can also add a high resolution (1920x1080) image which if selected by FetchCFD team will be displayed on the home page of FetchCFD. - Access and Contribute: You have an option to publish your project privately or to selective users of your choice. Also you can choose if you want other community members to contribute to your project. - Refetch: Refetch is a project inspired by (or contribution to) another project. The Refetch could be of your own other project or of a project of a community member of FetchCFD. When selected you will have a list of public projects to choose the original project which your project is a Refetch of. 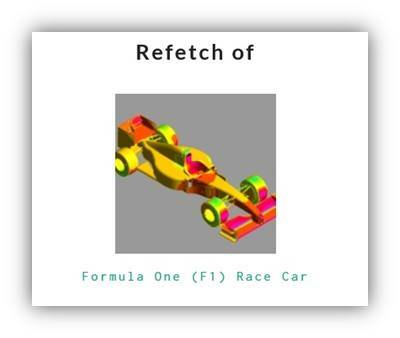 Once published the Refetch project will always refer to the original project as reference. 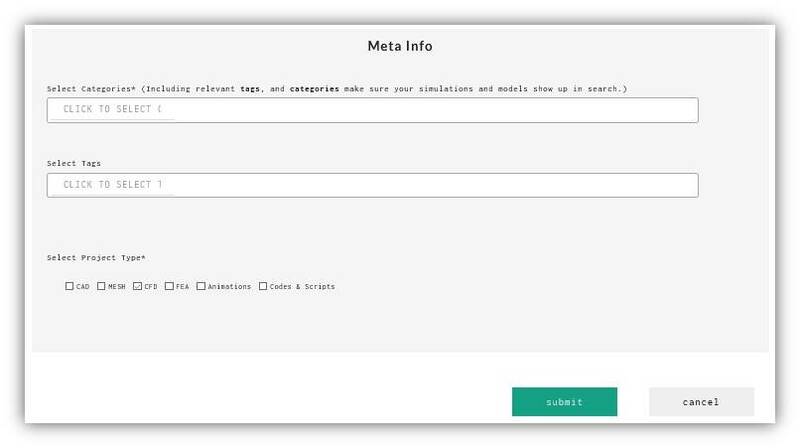 - Meta Info: Think of keywords that members will use when searching for your project. - Project Type: Select project type here. Note: If you do not select a Project Type, FetchCFD will automatically select CFD as Project Type. Once everything is complete, click submit button to publish your project! You will get confirmation that your project has been successfully uploaded.